KS600 is KyStar's best selling LED video processor and it is also one of the most cost-effective LED display video switchers made from China. 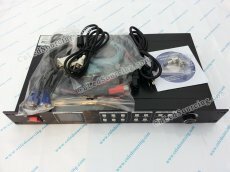 This amazing KS600 can install 2 popular sending cards such as Linsn, Novastar, Colorlight, Dbstar, Zdec, etc. The best price above does not include the sender cards. · Max resolution supported is 1920*[email protected] ，downward compatibility. ·Max resolution supported is 1920*[email protected] ，downward compatibility. ·Version：USB2.0，control driven need to be installed. .Baud rate 9600， RJ 11 to RS232 cable provided. .Every channel supports fade in/out switch.